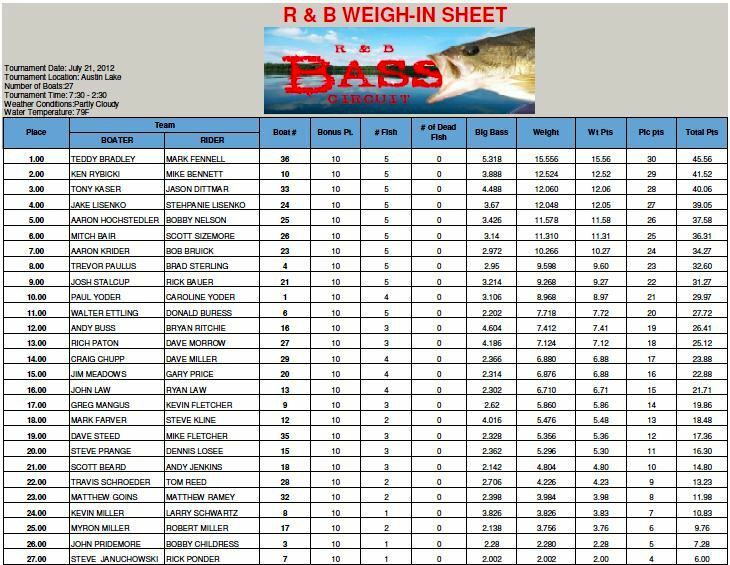 Despite tough fishing prior to the tournament, Austin Lake provided, arguably, the best weigh in throughout the R & B's history. For the first time, every team weighed fish. Fifteen fish over three pounds were brought to the scales, but none more impressive than the 5.31 pound smallie that won the big fish award. A pair of familiar names are now on top of the Standings, but the spread between all teams is very tight: 10-12 points separating 8-10 positions. 1st Place: It appeared the defending Points Champions were against the ropes: neither members had ever seen Austin Lake before, and their late arrival deemed them the call boat. Maybe it was being fashionably late, or plain ol' dumb luck, but by the end of the day, Teddy Bradley and Mark Fennell left not only winners, but leading in the Standings as well. went far from there. 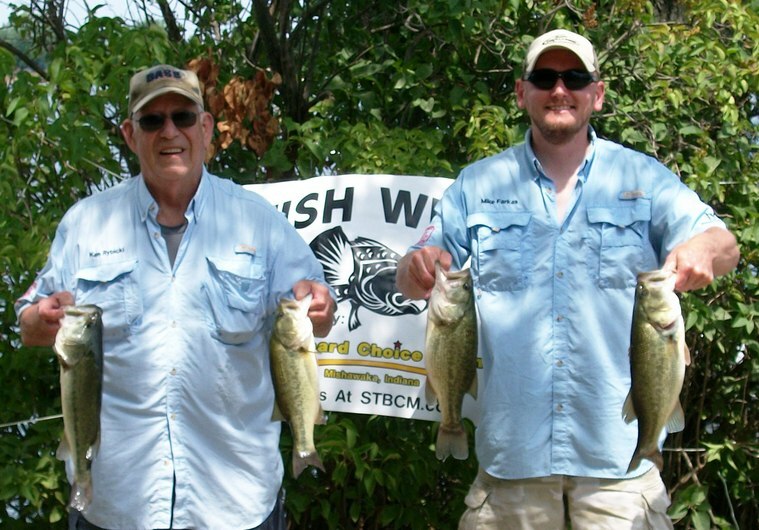 Like many others, they tossed topwaters early and were rewarded with a 3 pound largemouth. Fennell, however, caught something much bigger - himself. While unhooking a non-legal fish, one of the hooks caught his pinky finger and went all the way through. After some grinding teeth and careful work with pliers, he removed the hook. The topwater bite died shortly thereafter. Fennell takes a lot fo pride in his product, D's Lures, and they sure shined on this day. The team tossed green pumpkin/gold D's tubes with 1/2 ounce D's Lures tube jigs. Why so heavy? "The day before I was on the Detroit River fishing 20 feet of water with current. I had this tied on from the day before and was too lazy to switch." An unbelievable decision considering the amount of anglers who had practiced and had a game plan heading into the day, because that decision led them to victory. 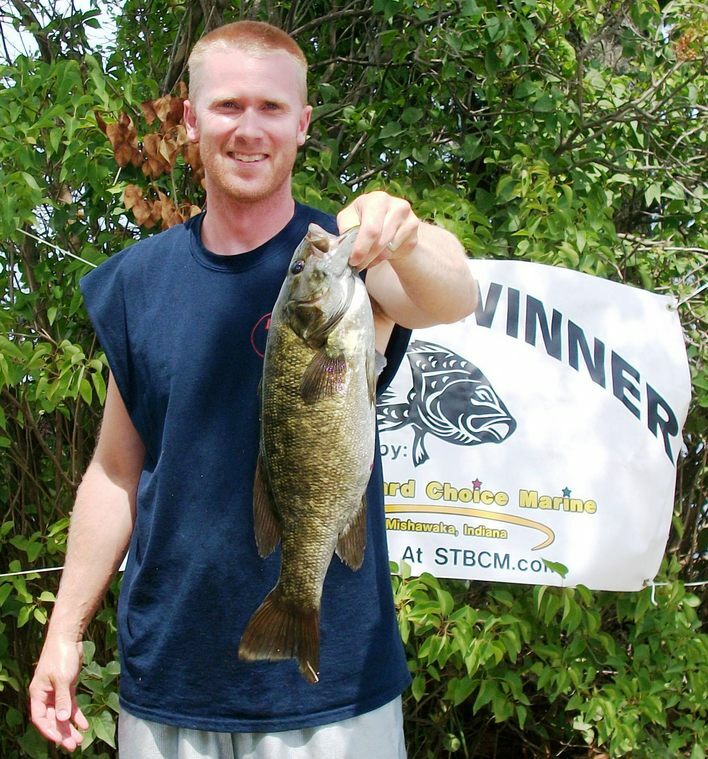 After a few shorts, Bradley was persuaded to try the heavy jig as well and in just five casts, he landed the Starboard Choice Marine Big Bass - a hefty 5.31 pound smallmouth bass. They went on to finish their limit by 9:15. It slowed down from there, but most of their damage was done. That is until Fennell landed a 4+ pound smallmouth in the first part of the afternoon. That fish was nail in the coffin. 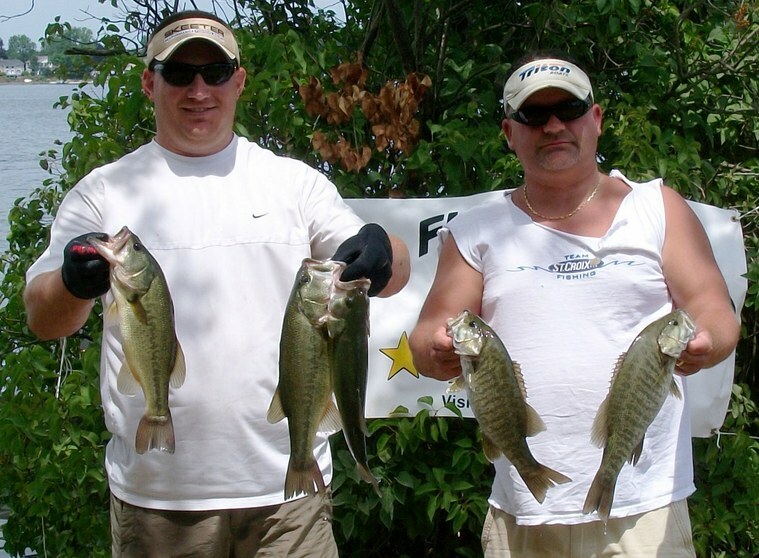 The 15.56 pound limit won them $605 and the big fish won them an additional $216. However, the limit was also the third largest in R & B History while it also puts them 2nd in most Top 5 finishes and All Time Money Winners. They also become just the fourth team to win multiple R & B events. 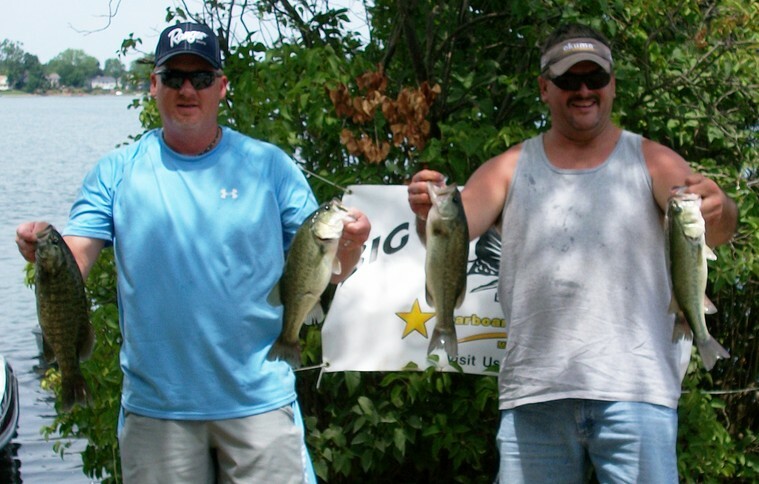 2nd Place: Ken Rybicki and Mike Bennett had one of the few great practices reported beforehand, but two hours into the tournament things looked grim - they had not had a bite. 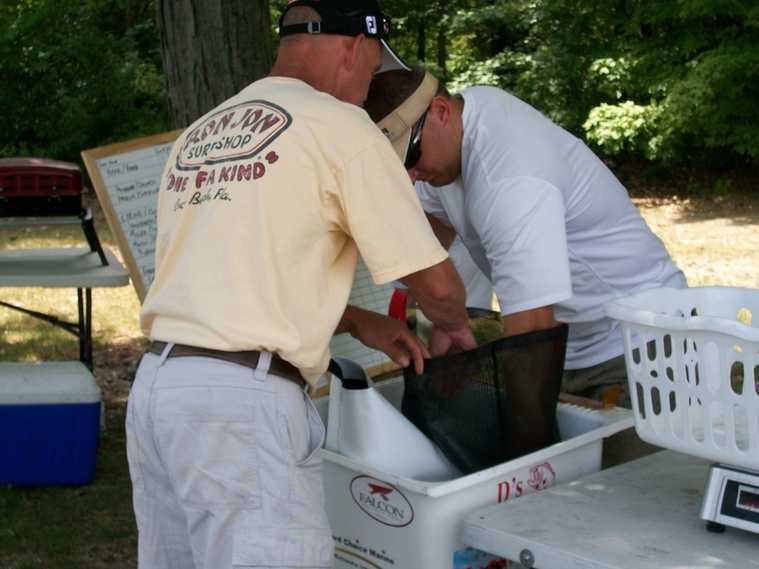 But they stuck it out in the area they had confidence and bagged 5 keepers which weighed 12.52 pounds and won $320. They also now stand in second place on most Top 5 finishes. spots with sparse weeds, but they switched to senkos with areas of heavier weed cover. Rybicki explains his stubbornness from leaving the area, "We knew the area had fish and in practice we had over 15 pounds, so we knew it held good fish. We felt we just needed to wait them out." 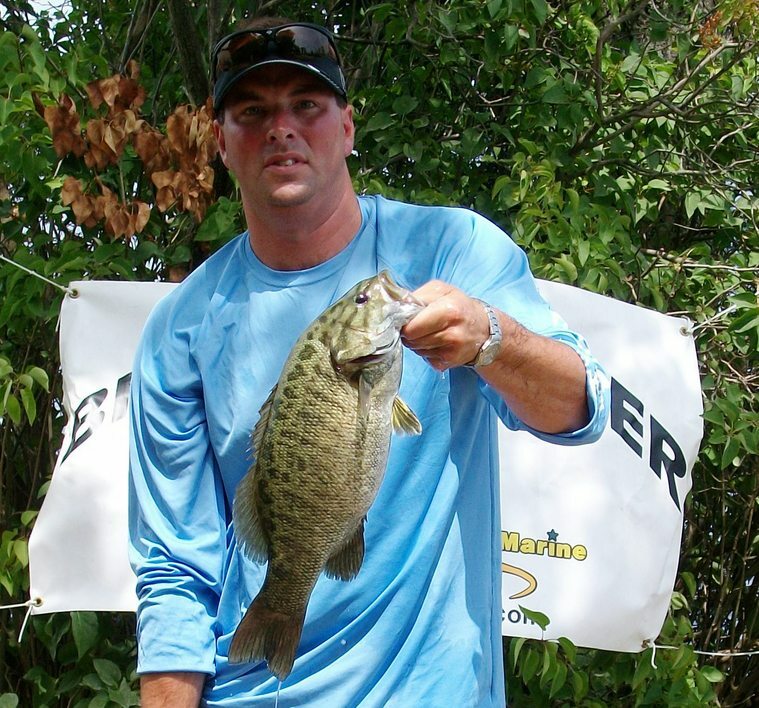 3rd Place: Despite fishing without a partner, and forgetting to smile in the photo, Jason Dittmar landed 12.06 pounds by employing much the same as the winners did in the same area. Dittmar admits, "We could see each other the entire time." However, Dittmar had more success with the pop r. He got two quickly and then culled three times with it in the last 90 minutes. He recalls, "After the two on topwater, I did not get another keeper until 10:00. 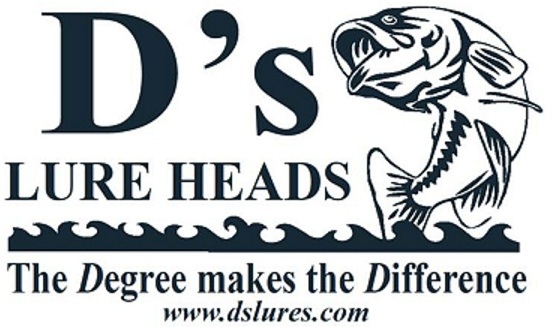 I began tossing the tube [D's green pumpkin/gold with D's 1/2 ounce tube jig] because I saw Teddy and Mark catching them with it and almost immediately caught my big fish (a 4.49 pound smallie)." The limit won him $210 and has given him and partner, Tony Kaser, new hopes in qualifying for the classic despite missing two events. Dittmar and Kaser are the defending 2011 Classic Champs. 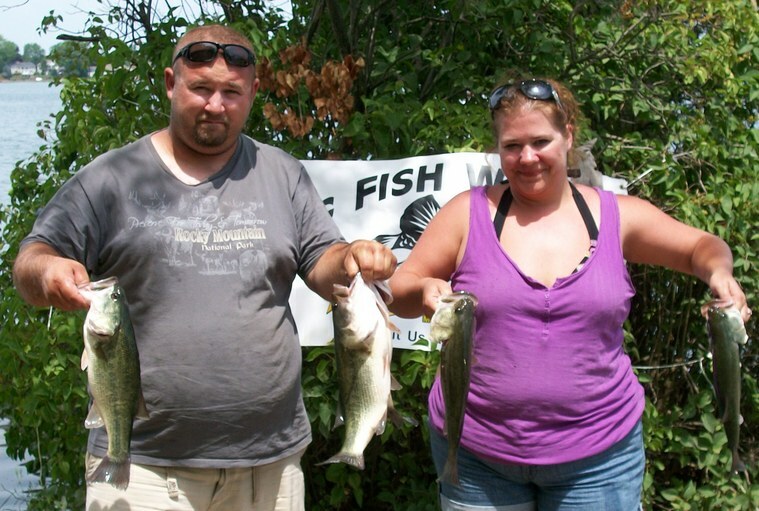 4th Place: Husband and wife team, Jake and Stephanie Lisenko, recorded their first top 5 finish of the season despite coming to a body of water they were less than thrilled to fish. "I hated this lake. We practiced five times and landed three keepers total," admits Jake. Their mood changed quite a bit since the 6:30 takeoff though, "I hope we come back next year!" he adds with a laugh. looked doubtful. But that keeper came in an area they had not fished before and the timing was perfect. Between 10:15 - 10:45, they caught an incredible 17 keepers! The spot was 30 yards long and consisted of a one foot drop along a weedline. The breakline was free of weeds making a perfect ambush spot. The team caught the first few fish with a wacky worm, but once they noticed the bass spitting out bluegill, they switched to swimjigs in a bluegill color scheme and did most of of their damage with this jig. The retrieve was "Just fast enough to keep it off the bottom." Their best five weighed 12.05 pounds and awarded them $165. 5th Place: Veterans of the R & B, and no strangers to success, Aaron Hochstedler and Bobby Nelson have quietly cashed in three of the four events; which is more than any other team. The record books show them as the 2010 Points Champions but they also hold the current record for the most Top 5 finishes - seven. directors a few names because we only had one keeper after four hours." The struggle was exasperated by their three hour drive. "But we caught four more keepers in 30 minutes." 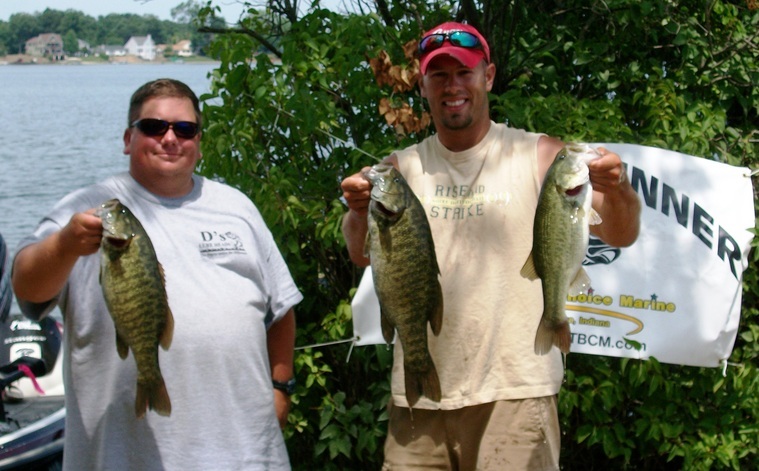 They went on to cull four times to accumulate a weight of 11.58 pounds and win $100. Their weapon of choice was a weightless, Texas rigged senko. Color did not seem to matter as they caught fish on several colors. What was important was the retrieve. 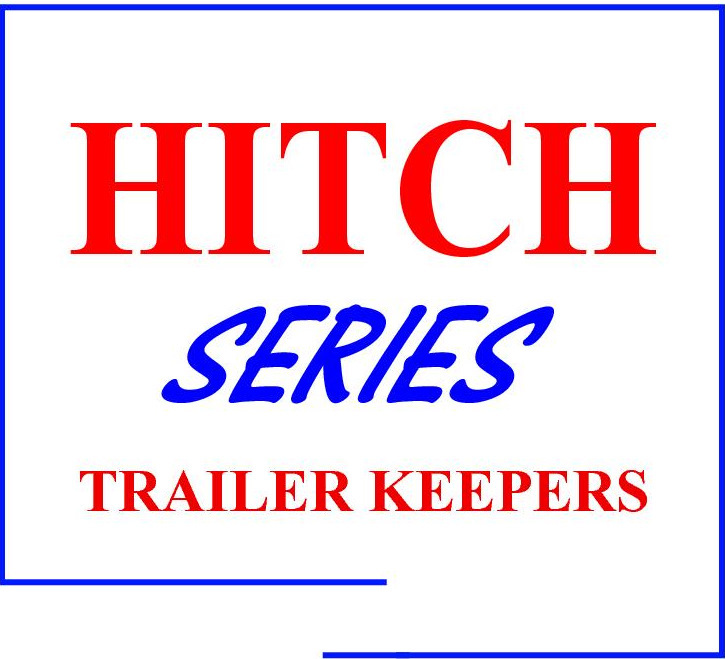 Hochstedler reveals, "It had to be extremely slow and methodical." D's Award:Mitch Bair and Scott Sizemore bagged an 11.31 pound limit and were recipients of the D's Award - an assortment of tubes, jigs, and shirts. Solar Bat Big Bass Award:Tournament Directors Andy Buss and Bryan Ritchie landed a 4.60 pound smallmouth bass to win $54. They proudly display their Solar Bat sunglasses and are eligible to win a new pair. The tournament directors want to thank the many people who help our tournaments run smoothly. 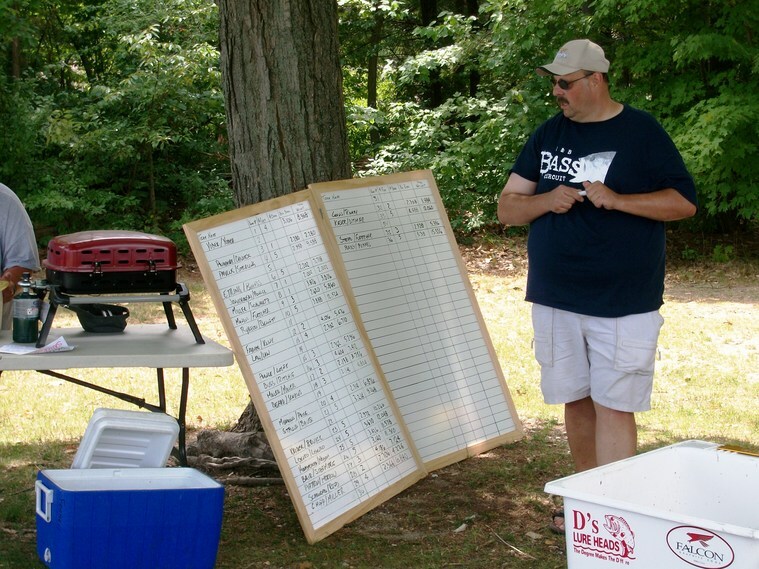 With their help, we were able to weigh 27 teams and and hand out prizes in just 30 minutes! Surely this helped preserve the fish weighed. Below left, Mitch Bair bumped fish and provided the new weigh bags. Below center, Rick Bauer recorded weights on the board. 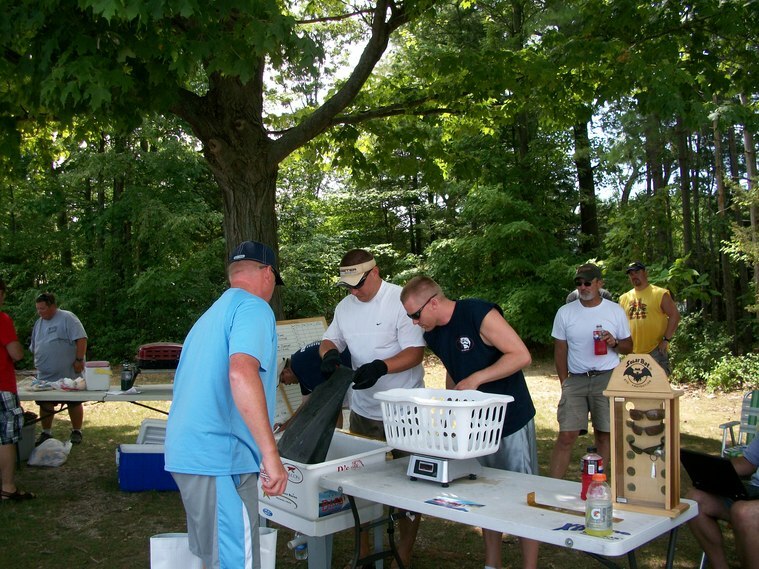 Pictured at top of page, Travis Schroeder and Tom Reed sold 50/50 tickets and acted as the Check in Boat. Mark Fennell, in the back of the far right photo, roasted hot dogs. Not pictured are Steve Prange and Dennis Losee who check livewells and Steve Januchowski who takes photos for the website. Click on results for a .pdf file.